Today my guest is Randy Mosher. Randy is the author of several of my favorite home brewing books including Mastering Homebrew, Radical Brewing and Tasting Beer (Amazon affiliate links). He’s also a partner at Five Rabbit and Forbidden Root breweries in Chicago and instructor at the Siebel Institute. His web site is RandyMosher.com. We start with a short discussion of Randy’s recent trips. 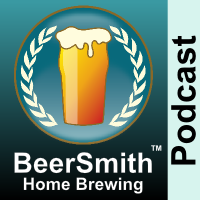 He introduces the New England IPA style and we talk about why it is so controversial (and hated) for some brewers. Randy describes the taste and sensory analysis for a NE IPA. We talk about what makes NE IPA different from traditional IPAs. Randy provides the grain bill he uses as well as how to mash it. We get into an interesting discussion on the use of hops during active fermentation and biotransformations that are possible. He describes how some hop oils can react and change during active fermentation and how that alters the flavor. We discuss yeast selection and fermentation for a New England IPA. He shares his thoughts on dry hopping for this style as well as haze.